﻿ PORTWELL ANNOUNCES HIGHLY COMPOSABLE IOT GATEWAY - XM-1- Portwell, Inc.
Portwell, Inc.,(www.portwell.com.tw) a world-leading technology innovator in the Industrial PC (IPC) and embedded computing markets, empowering the Internet of Things (IoT) with intelligent gateways and edge devices, announces XM-1, the first IoT gateway to feature international patents of highly composable structure. XM-1 satisfies customers’ requests for an IoT gateway solution that can meet the requirements emerging from an extensive range of IoT applications. Due to local/specific infrastructural challenges -- such as transmission distance, geological obstacles, limitation of regulation and/or power consumption -- a system integrator involved in a wide variety of IoT projects might need to deploy a gateway solution, ideally, designed with various communication interfaces to ensure that data can be collected effectively under the same IoT structure. With the modularized design of XM-1, the same system integrator can select and "insert" the communication module/s based on "actual" application needs and requirements instead of preparing several different hardware gateways. For example, intelligent agriculture can utilize LoRa long range, low power wireless technology for collecting data, plus LTE (Long-Term Evolution) high-speed wireless communication to connect to the cloud. 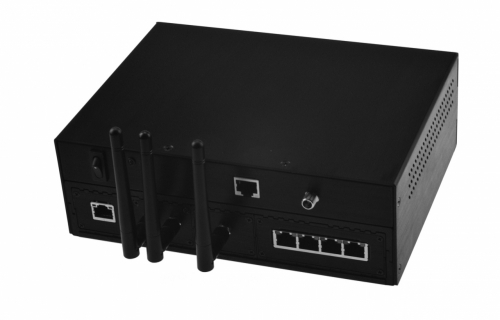 In other cases, the system integrator might be required to choose to adopt Wi-Fi instead of LTE, and accordingly the LTE module could be exchanged with a Wi-Fi module swiftly and easily. Portwell’s agile XM-1 modularized IoT gateway not only helps save costs, but also provides remarkable flexibility for unlimited IoT deployments within an evolving IoT world. When a communication or connectivity system encounters technical issues, or requires an upgrade, engineers no longer need to open the system/gateway chassis. With its hot-plugging capability, XM-1 facilitates easier maintenance and upgrade. This modular design can dramatically decease the training time for technicians and help the enterprises lower costs and enhance efficiency. World-first with patent of Fan-less design and cross-platform gateway solutions for the Internet of Things (IoT). It provides with flexible choice of every wire or wireless communication interface. Its structure creates more selectivity, expandability, connectivity and convenience to the IoT application, which can help develop IoT system rapidly.